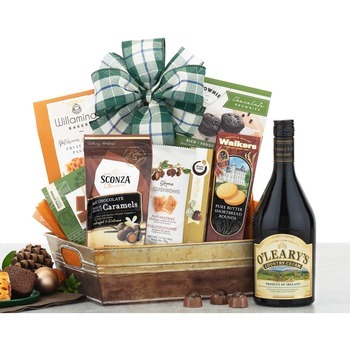 Maloney's Irish Country Cream is a smooth blend of rich Irish dairy cream, wine, natural chocolate and vanilla flavors. A collection of Lily O'Brien's - Ireland's best loved chocolate - includes vanilla and dark chocolate truffles, chocolate chip cookies and milk chocolate sticky toffee arranged in this wooden serving tray. 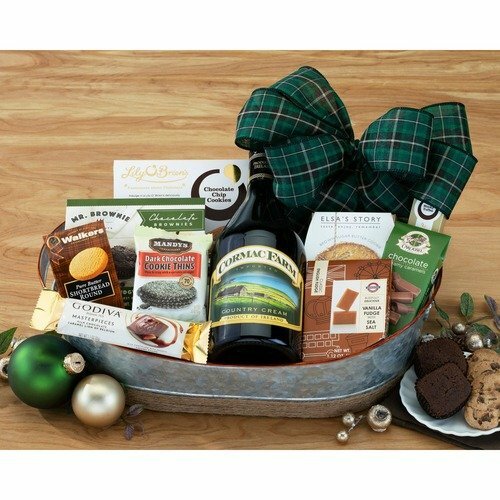 A unique combination of our favorite Irish indulgences. * 1st in Flowers goes the extra mile in delivering flowers. On my wife's first day at a new job they dealt with high security and got the delivery to her on time. Kudos to 1st in Flowers for their quality product and persistence.